Ah, it’s that time of year again: that wonderful time when we get to start fresh, set unrealistic goals, and punish ourselves and feel ashamed when we don’t achieve them. Or at least that’s what usually happens, right? We want to be as good as or better than ________ (insert name of dancer you LOVE here) when really, we should focus on self-improvement and being better than we were last year. Stop saying, “I want to dance like Alien Ramirez” (note: I chose her name because I actually used to say that all the time!). Instead, say “I want to dance like ME, but better!” Striving to improve your dancing is wonderful, whether it be through taking classes or workshops or just simply practicing more often, but you are YOU and the goal should be to be content with what you have to offer. Sometimes, I hear people say, “Oh, I haven’t been dancing very long, so I’m not as good as _________.” Stop doing that! Some people have been dancing at the same level for ten years without taking any classes and they are content (which is OK, by the way). Some have been dancing for six months, have worked their butts off by learning as much as possible, and have progressed incredibly quickly. Don’t worry about how long you’ve been dancing–just focus on where you want to go. Another odd comparison I have noticed over the years is that some folks lie about how long they have been dancing. Perhaps they are trying to impress people with their skill level by saying they are brand new to Latin dance when they’ve actually been dancing for a while. I have heard this many times: “Oh, I’ve only been dancing for two years”….yeah, but that’s what you said last year! This is an interesting phenomenon. There is no shame in being honest with yourself and others. It’s not a contest. This point is linked to the previous two. We want more and we compare ourselves to everyone and therefore, we want to go to all of the events. It makes sense: if I attend every social and every workshop and every congress in my area, I will be a master of salsa by the end of the year…right? Well, no…and you won’t have much left in your savings either. This year, allow yourself to do a little bit less. Instead of attending everything, do your research. Find out which artists are teaching and/or performing at these events and pick and choose the ones you don’t want to miss. If there are six socials per week where you live and you want to go to all of them, great! If you’re exhausted and you can’t keep up, go to the ones that make you happiest, or to the ones that are closest to where you live. You do not have to do everything. I repeat: you do NOT have to do everything. This has been a tough lesson for me to learn over the years, as I tend to feel guilty if I miss an event. This ties into point number two, about those constant comparisons. “If I don’t go to such-and-such event, then I won’t learn the workshops that will make me as good of a dancer as so-and-so.” Or, the dreaded “If I don’t go to such-and-such event, so-and-so will be mad at me.” It’s time to let go of this mindset, so set a goal for yourself to be a little more picky and a little less guilty about the things you miss. There was no way I was going to miss out on learning from Anya and Luis or Patrick and Scarlet at Prairie SalsaFest last summer! If you haven’t made any dance resolutions yet, here are some suggestions. Pick one or two and really work towards them. Good luck, and happy new year! -Choose ONE festival/congress you’d really like to go to this year. Save up and GO! -Make an effort to dance with one new person at every social you attend. -Pick ONE class you really want to take and sign up. Convince a friend to take the class with you. 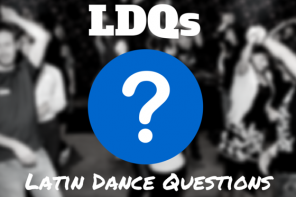 -Get to know some more people in your dance community. Share a drink or a meal together every now and then before or after a social. -Stop doing something you don’t like. Maybe you thought you should perform but you actually hate it…don’t do it anymore. It’s that simple. 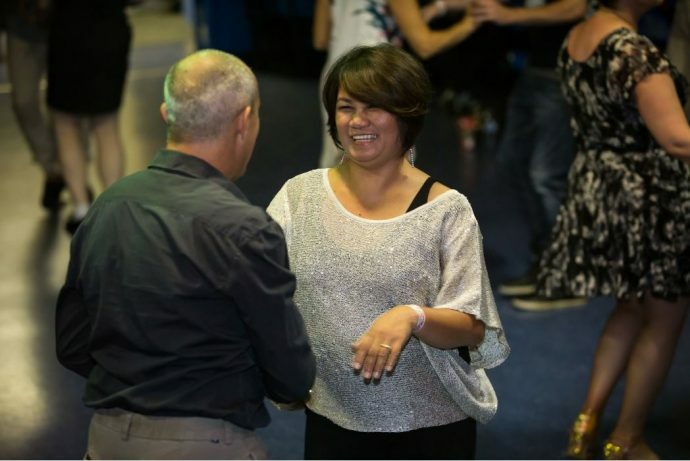 -Learn a new skill–whether it be a pattern in a dance you know or some beginner skills in a dance with which you are unfamiliar. Sometimes, a challenge is a great way to reignite the spark for dance. Do you have any other suggestions? 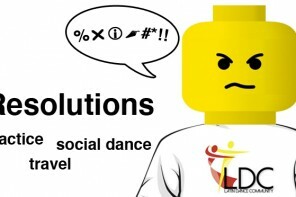 Share your #danceresolutions with us on facebook, Twitter, and Instagram. Sarah Liz Vuong is a high school teacher by day and salsera by night. Originally from Red Deer, AB, she currently resides in Regina, SK, Canada. Her favourite dance styles are salsa and bachata and she has become hooked on the power of social dancing. Her greatest inspiration is her mother, a fellow writer, who has had a physical disability for many years. Sarah Liz is grateful every day to have the ability to dance. She also enjoys teaching and attending fitness classes, travelling, reading, watching horror movies, and spending time with her adorable husband, Michael. How to stick to NY Resolutions and DANCE!